Home ABOUT ETHANOL FIREPLACES Do we need to service the fireplace? Traditional fireplaces (such as wood or coal) under certain conditions tend to be inconvenient to use. We have to remove the ash, store the fuel and clean the chimney. Similarly, if we install a gas fireplace, we have to keep in mind the limitations imposed by the chimney and gas connection. In the case of fireplaces we have no such problem. Their maintenance is limited only to refueling, while the construction itself requires no maintenance, periodic inspections and additional works. The structure of the ethanol fireplaces is mainly made of steel, glass, stone, ceramics. These are materials that do not suffer degradation and gradual deterioration. So they do not have to be periodically replaced, repaired or supplemented. The only operating procedures include looking after procedures, namely, cleaning a bio ethanol fireplace and possible impregnation of the surface that require it. However, it shall be carried out according to strict bio ethanol fireplace manufacturer’s instructions. 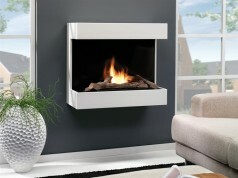 Previous articleHow often we could use a bio ethanol fireplace? Next articleWhat materials is bio fireplace composed of?